So, while this is a touch late for Halloween (only slightly), I got a little behind on work and therefore my game playing. I wanted to list some of the things I have found myself shrieking like my 5 year old self that my badass 15 year old self would probably be roflcoptering at. First off, we'll go along with the realm of imagination and tabletop roleplaying. Let me just say, I DO NOT like Attic Whisperers. Children in themselves are kinda scary to me, but when you have a dead one that just wants a friend to play with but will kill you if you do is just all the more horrifying. Not because of the idea in itself, but because it makes you realize what kind of person you really are. In my case, the party said "NOPE! ", turned around and locked the door. However, then you realize that you either by some miracle could have aided the child, died trying to be a good person, or in fleeing save yourself but turn your back on neglect. Proof in itself the scariest monster is indeed, humankind, and in this case, yourself. The look of horror on Randal's face is probably what mine looked like the entire time I played Slender. Although here's a comic that might be the real story, thinking about it makes the game even scarier, mostly for the reason above as mentioned with the Attic Whisperer. The most horrifying part of this game besides the increasingly scary ambience and reduction in teleportation radius for the Slenderman, is the fact that he's yet another monster that forces you to look deep inside yourself. Also, I found this to be really amusing, I'd probably have the same reaction. I think my critter hung out for about 5 minutes, seeing those white empty orbs for eyes from a distance was even unsettling in real life. The worst part, the creatures might be real, or hallucinations, you never know. I remember also taking about 10 minutes to steady myself near the chemistry set in the laboratory, the reason? I had recently played through Silent Hill 3, bad things happen when you turn valves in that game! Regardless, this is a game where you don't get desensitized to the horror, like Slender, it simply builds upon itself. I'll play more once I overcome my paranoia of clicking the executable, and have purchased some Depends ;). Seriously, it's a walking cervix with harlequin ichtyosis, get back inside where you belong! >.< The noises they make, they either mumble, or when left on the ground alive, begin screaming like a baby, scary I tell ya! But the redemption is that this game is extremely tongue-in-cheek with its unlockables, so, despite having to see these types of baddies (all associated for the most part with things that can go wrong during pregnancy), I find myself playing it again and again. 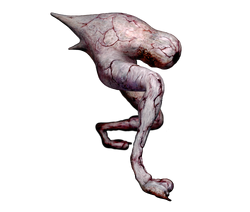 While tedious, I enjoyed Homecoming for its storyline and creature design, and Downpour, while lacking on creature design did have a rather interesting story pulling it along, but I do wonder why the final boss is after you despite knowing the truth of the situation, perhaps it's another Silent Hill psyche trick. Overall, I recommend each of these games, despite my dated reviews, very highly!